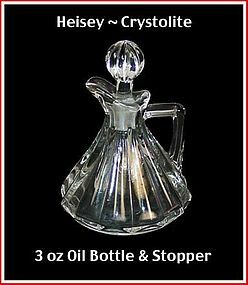 Heisey Crystolite 3 oz Oil Bottle & Stopper ~ Nice! This Heisey Crystolite 3 oz oil bottle is in excellent condition and the stopper is perfect! NOT Cloudy!!! 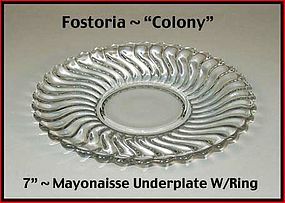 This is the underplate for the Fostoria Colony mayonnaise set. 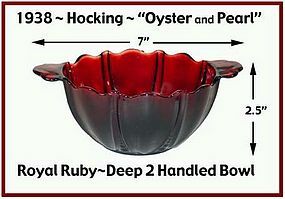 It does have the ring to center the dish on the plate. Excellent condition! 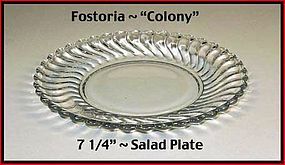 This 7 1/4" Colony salad plate was made by The Fostoria Glass co. in the 1950's. It is in excellent condition! 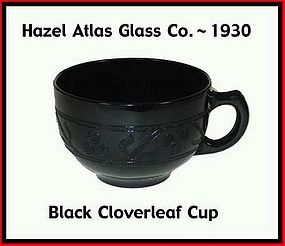 This Black Clover Leaf coffee cup was made by Hazel Atlas from 1930 - 1936. Excellent condition! 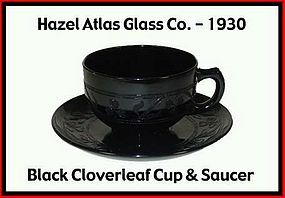 This Black Clover Leaf coffee cup and saucer was made by Hazel Atlas Glass Co. from 1930 - 1936. Excellent condition! 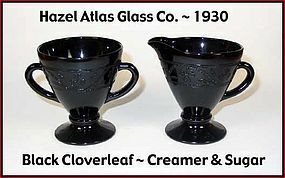 This Black Clover Leaf cream and sugar set was made by Hazel Atlas Glass Co. from 1930 - 1936. Excellent condition! 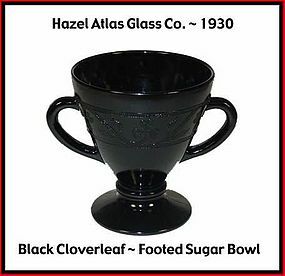 This Black Clover Leaf sugar bowl only was made by Hazel Atlas Glass Co. from 1930 - 1936. Excellent condition! 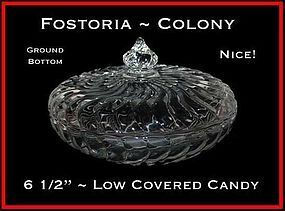 This Fostoria Colony low covered candy is in excellent condition and has a ground bottom. Very bright and shiny glass! 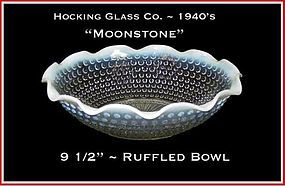 This Moonstone large 9 1/2" crimped/ruffled bowl was made by Hocking in the early 1940's and is in excellent condition. Please check our other Moonstone we have for sale. 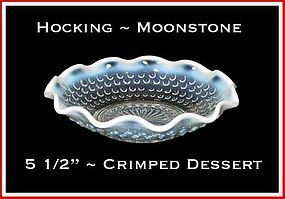 This Moonstone crimped/ruffled dessert bowl was made by Hocking in the early 1940's and is in excellent condition. Please check our other Moonstone we have for sale. 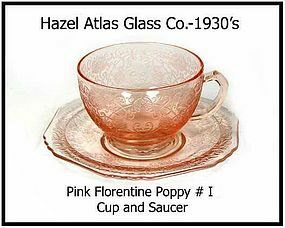 This pink Florentine Poppy #1 cup and saucer is in excellent condition. The color is the very pink shade that all collectors like. Beautiful! 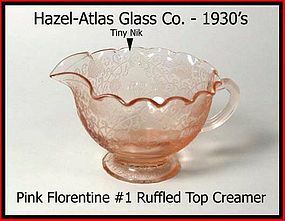 This ruffled top Florentine I creamer has 1 tiny nik on the inside at the top (see photo). It is otherwise in good condition. 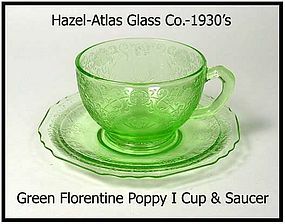 This green Florentine #1 cup and saucer was made by Hazel Atlas in the 1930's. They are in great condition! 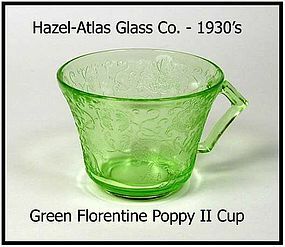 This green Florentine #2 cup was made by The Hazel-Atlas Glass Co. in the 1930's. It is in excellent condition. 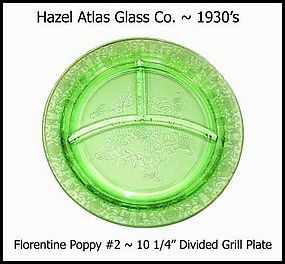 This Florentine 2 green grill plate was made by The Hazel Atlas Glass Co. in the 1930's. Great condition! 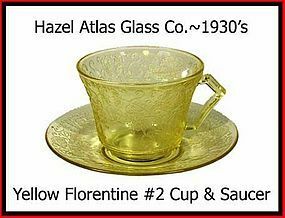 This Florentine #2 yellow cup and saucer is in excellent condition. 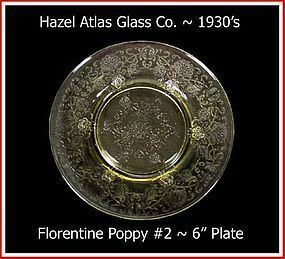 These 6" bread and butter plates are made by Hazel Atlas and are in excellent condition.